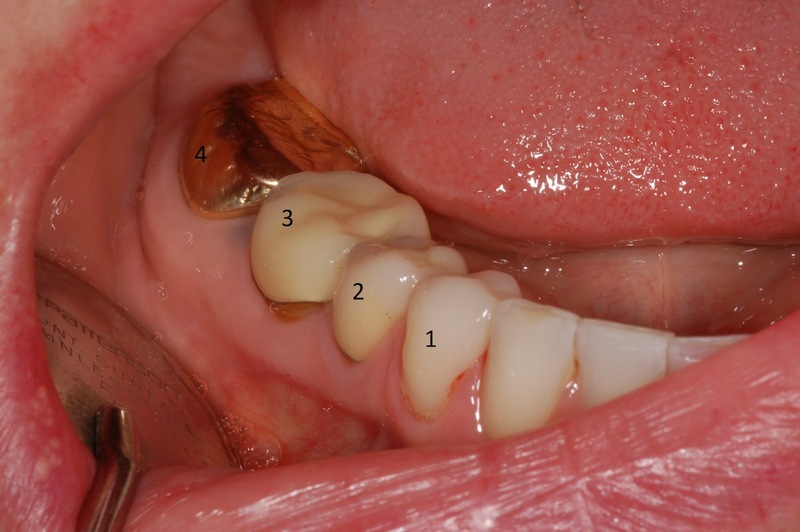 Dental crown categories can be sub-divided into porcelain fused to metal 3,2 (many different types of metal being used), porcelain fused to ceramic (alumina and zirconia but really just zirconia), metal crowns 4 (many types), ceramic crowns 1 (also many types), and the newest form of ceramic/resin hybrids (also many types). Three different common types are pictured below. Over the last 10 years there has been a huge increase in the both the number of different types of crowns being used and (as with most new technology) a wide range in the quality of those new crowns being offered. In other words, “a crown is not a crown is not a crown.” Most of the results for survival come back to the strength of the material being used, so I will discuss that briefly. PFM has a bilayer construction so strength is some somewhat subjective and highly correlated to the dentist giving the technician the proper amount of room to work. 1300MPa is the number seen occasionally. Zirconia ceramic crowns have a strength of over 1200MPa and need very little room so less technique sensitive in that regard. Lithium disilicate ceramic crowns have a strength of 360-400MPa and also need the correct amount of room. Metal crowns were found to have the longest survival—68% at 10 years, and all-porcelain crowns the shortest—48% at 10 years. Factors which were found to influence outcome of crowns included type of crown, age of patient, patient payment exemption status, patient attendance pattern and placement of a root filling in the same course of treatment as a crown. 5 year survival rates EBD Dorri 2013 of ceramic crowns. 5 year fracture rate of 8% on molars seems high to me. I’m guessing many studies were using materials before advent of emax and Bruxzir.